Would you like to learn basic knitting! ….. or do you already enjoy just simple knitting! 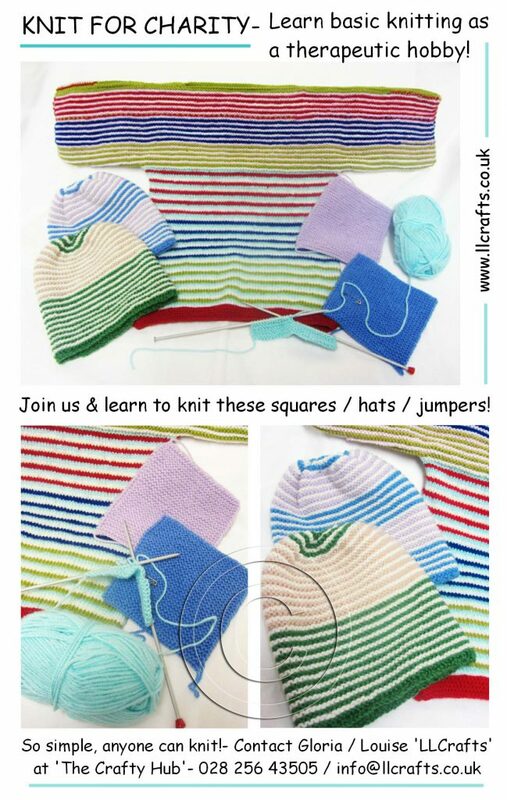 We are starting a ‘KNIT FOR CHARITY’ group, held on Saturdays 2-3pm from 13th April …… where you can come along each Saturday and learn how to knit very basic, simple squares / hats or jumpers, which can then be handed into local charity shops. It will be held in ‘The Crafty Hub’ ‘LLCrafts’ art studio in Galgorm, Ballymena …… and has limited seating, so please get in touch with us first. Cold drinks and biscuits will be supplied …… so simply come along, have a knit, have a natter, and relax for an hour! Some more wee ‘LLCrafts’ crafty pieces donated to ‘Habitat Restore’ charity shop in Ballymena last week ……. 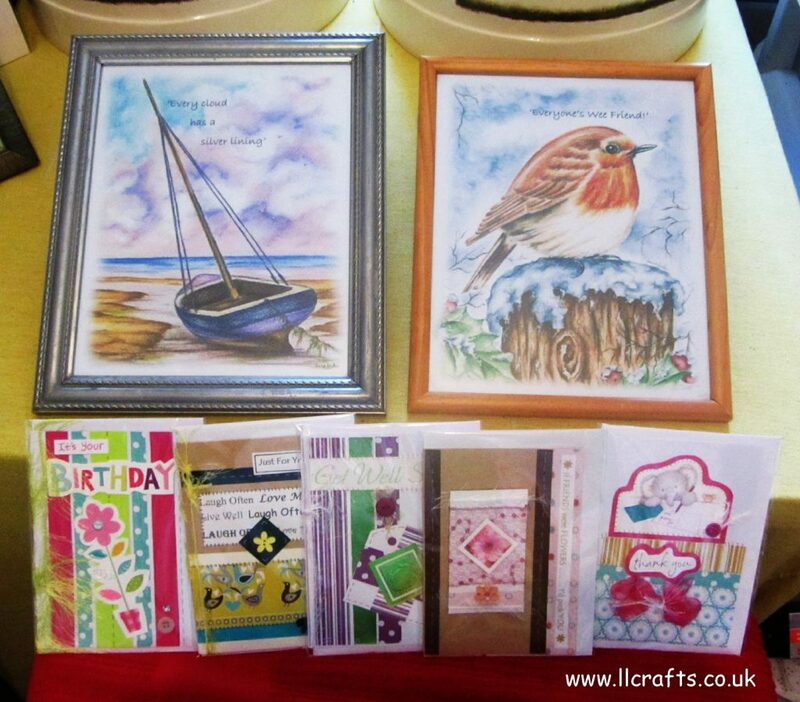 hand-made cards and framed artwork, using frames we had previously got in the charity shop! I do love RE-CYCLING ! I have always loved making cards and find it relaxes me, so am very happy to donate to some charities and help spread a bit of goodwill! 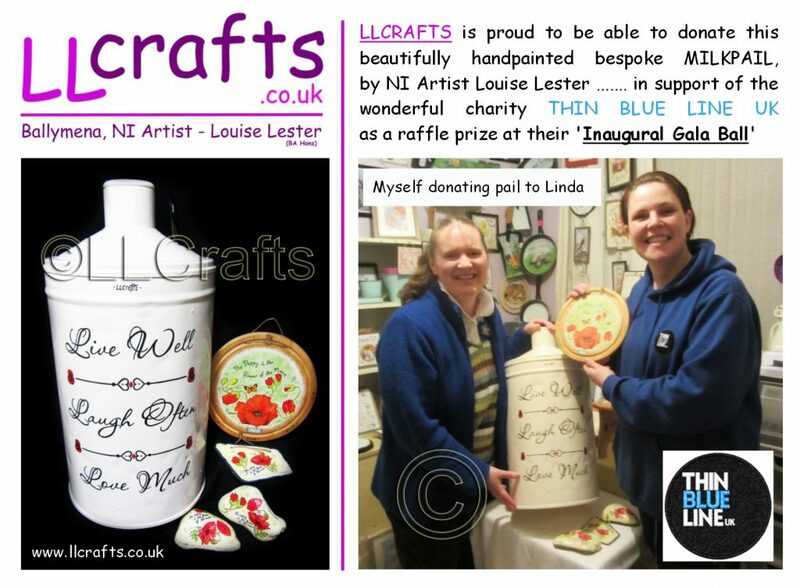 It is brilliant and a great pleasure, for LLCRAFTS to be able to support the wonderful charity cause THE THIN BLUE LINE …… by donating this beautifully unique ‘One of a Kind’ bedpoke hand-painted Milk Pail (painted by myself Ballymena, NI Artist Louise Lester) as a raffle prize on the night of their ‘Inaugural Fundraising Ball’. So, show your support for this wonderful charity cause …… and it was my pleasure donating this wee milkpail to my art student ‘Linda’ who is one of the main organizers for the charity! Hope you’s all have a brilliant fundraising night, all the best from LLCRAFTSFUNDRAISING! Available to anyone wanting to raise funds for a good cause! Would you like a FREE 100 Lines ‘Fundraising Pack’ to help raise funds for your charity good cause! FUNDRAISING MADE VERY SIMPLE – with a bit of craic and fun! The pack includes a POSTER, a set of COLLECTION LINE pages and a FREE 1ST PRIZE of an LLCRAFTS ARTWORK! Just get in touch with us, as we at ‘LLCrafts Fundraising‘ just love to help and support local charity good causes! 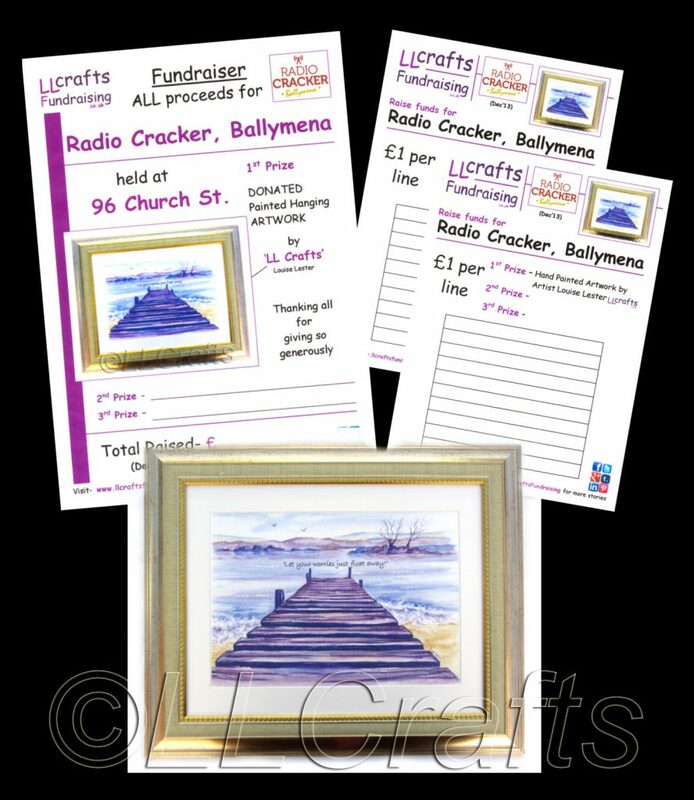 The photo below shows an example of a past charity cause **Radio Cracker, Ballymena** who used our FREE pack, which helped towards raising £60,000! ….. Wow, brilliant!! We will design and supply your fundraising pack FREE helping you to raise at least £100, or less or more …… using your charity name. We will also donate the 1st Prize – an ‘LLCrafts Artwork’ ….. all you need to do is find a 2nd & 3rd Prize and then have 20-30 willing people to collect in £1 or 50p a line! ALL VERY SIMPLE! So contact us and we will be able to help you raise some much needed funds for your good cause!